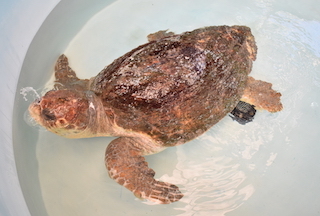 Did you know that loggerhead sea turtle are the largest of the hard-shelled sea turtles? Leatherback sea turtles are larger, but as their name implies, their shells are not hard. 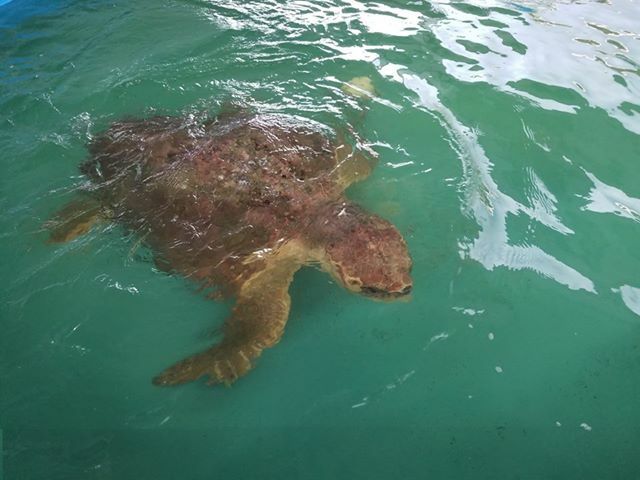 This female loggerhead sea turtle was rescued from the water by Tarpon Bay Explorers and Sanibel Captiva Conservation Foundation (SCCF) members after she was spotted floating with her back end up. She weighed in at approximately 290 pounds! Veterinarians performed an intake exam in which they took radiographs, drew samples of blood for testing, checked for injuries, and checked the eyes and mouth. They noted that she had a fracture at the rear of her shell, but it was difficult to determine if it was recent or an older injury. Once the area is cleaned, they will be able to tell. Based on their observations, veterinarians believe the turtle is also affected by red tide. 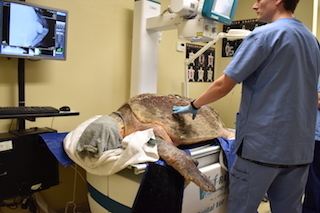 Veterinarians cleaned the fractured area of the shell this morning. After removing the epibiota and other debris, they were able to determine that it is an older injury and likely did not happen recently. An ultrasound was performed to determine if she was carrying eggs. Veterinarians were unable to detect the presence of any eggs inside her. 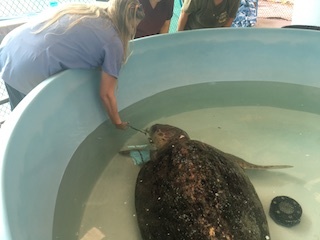 After spending the first 24 hours receiving treatments including fluid therapy, antibiotics and debridement of epibiota on her carapace and the associated wound, the turtle was moved to a shallow freshwater tank. The freshwater helps to kill any remaining epibiota and it is kept shallow so that she only has to lift her head up to breathe since she is still a bit weak. After spending a day in the shallow tank, rehabilitation staff were able to increase the depth a bit more today and she has been swimming around the tank. They have offered squid and fish, but she has yet to eat. It may take a few days for her to regain her appetite. 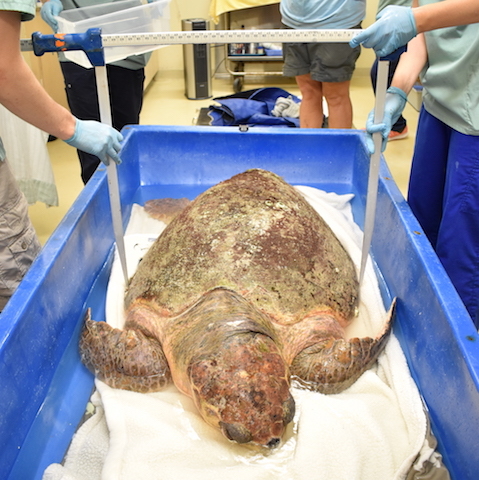 Rehabilitation staff reports that the female loggerhead has shown signs of an appetite returning by taking nibbles of some of the food being offered. The female loggerhead has been eating small blue crabs when offered. She does not, however, like to eat the mullet-stuffed squid she has been offered. Since the big girl is now stable and eating on her own, she has been transferred to Sea World to continue her rehabilitation. 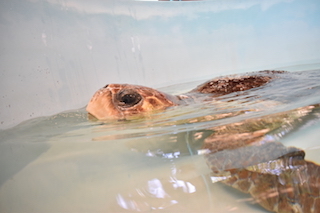 With a larger tank at the new facility, she will have plenty of room to build back her strength prior to release, while also freeing up space at our facility to treat more turtles being affected by red tide. We will continue to update her progress when we are provided any information. 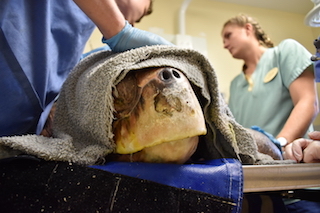 The female loggerhead was transported to Naples by Sea World staff today where she was released back in to the Gulf of Mexico. Recent red tide samples show zero to background levels of the red tide organism in this area.